THIS IS IT!!! LAST FUNDRAISER!!! Meet me at the Finish Line Fundraiser Event! PARTY ~ DANCE ~ & LAST HOORAH!!! 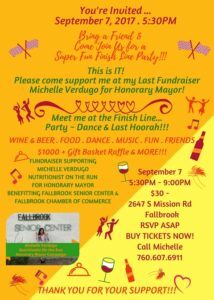 Please come support me at my last fundraiser supporting the Fallbrook Senior Center & Fallbrook Chamber of Commerce! 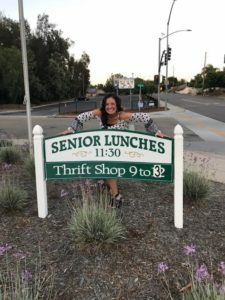 Every dollar raised is a VOTE for me to be your next Honorary Mayor and every dollar will make a difference in lives of home bound seniors receiving meals daily and in our special community! Dress cool & comfortable! This is a outdoor event ~ beautiful setting! See you Thursday! Call me if you have any questions! The home is located on Mission Rd. just south of Winterhaven on the West side of the road… balloons will be out , turn up long driveway to park in lot in front of the home! @ 2647 S. Mission Rd.